Source: "African Archery" by David Tukura, The Traditional Bowyer's Bible (Volume Three). Ethiopian archers during ancient times used footbows that were 4 cubits long (7 feet long) and fired arrows the size of javelins. African archers were so feared as archers that they were often hired as mercenaries in regions surrounding the Mediterranean. The Egyptian word for the empire of Nubia was "Ta-sti" which literally meant "the land of Bowmen". Ethiopian archers fought during the Trojan War on the side of Troy and the Trojans reportedly were overjoyed when their new allies arrived to help repel the Greeks. During the 7th century A.D. Arab invaders called their African enemies the "pupil smiters" because the African archers were so adept at shooting the Arabs in the eye pupil. 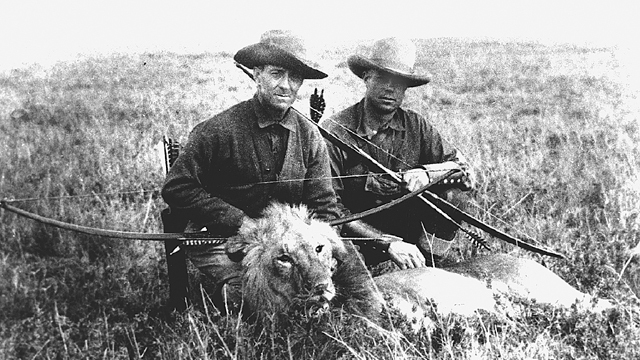 In 1925 Saxton Pope was visiting Africa when he was outdistanced by a Wakoma archer using a heavy arrow. He switched to a heavier yew bow and used a light-weight flight arrow, but only managed to beat the Wakoma archer by ten paces. Afterwards he called a halt to the contest, as the Wakoma archer would clearly beat him easily using a lighter arrow. Saxton Pope in Africa on a lion hunt. 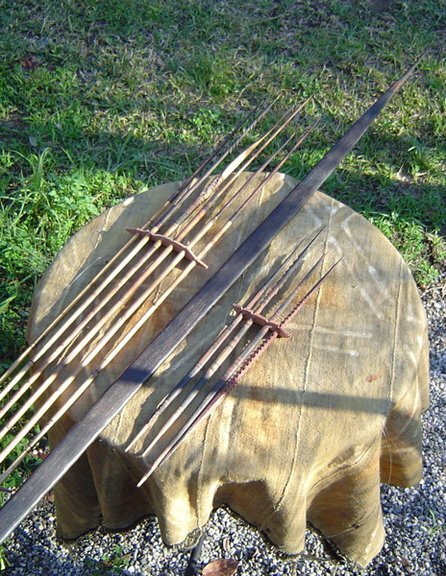 The Liangulu and Kamba tribes of Kenya routinely hunted for elephants using longbows with over 100 lbs of pull. Wambua, a famed archer from the Kamba tribe of Kenya, once shot an arrow at a target 50 yards away and then turned away and started walking before the arrow even hit it. His arrow, which was headless, hit the exact centre of the target - a perfect bullseye. The Bassa tribe of Nigeria were famed for both their archery skills and tactics, having mastered two unusual techniques: (1)The Back-fire technique, which consisted of feigning a retreat and then twisting around and shooting back at the charging enemy. (2) The Shooting the Skies technique, which consists of one volley aimed skyward so it falls vertically at the enemy, and a second volley aimed horizontally at the enemy. The enemy then has a choice, use their shields to protect from the first volley coming at their heads and shoulders, or use their shields to defend their chests, bellies and legs. In 1804 the Muslim Fulani invaded Bassa territory under the guise of a jihad (holy war), but really they were just there for slave raiding and to try to seize territory. While the Fulani tactics of horses and firearms did initially have some success, the Bassa fought back with ambushes and invented "string silencers" for their bows so they would be quieter. The Fulani raids continued for decades, but over time it became pretty clear the Bassa were winning and Fulani gave up and stopped raiding. One type of ambush the Bassa used was to warn a village of an approaching Fulani force and then deliberately open the village gates so the Fulani could just ride in. Bassa archers would then conceal themselves on rooftops and lay in wait. After the Fulani forces entered the village, they would close the village gates and the archers could begin shooting the trapped horsemen. It would be like shooting fish in a barrel. In 1914 the British were on the losing end of a Bassa rebellion and tried to exact "a fine of bows and arrows" on the Bassa for revolting. The Bassa paid the fine, but simply made more bows and more arrows. Trying to disarm them via a fine clearly did not work. The Zongulo tribe of Zwere traditional gives male infants a miniature bow to symbolize their hunter heritage. By the age of 7 they start shooting alongside other boys their age, shooting at moving targets is the very first archery lesson - done by rolling a melon at "top speed" across the ground. From there they graduate to shooting birds and rodents. As they progress they begin shooting at larger and large game, like antelopes, eland, impala deer, and buffalo. Other groups have similar traditions of introducing archery at a very young age. "Without a bow you are not a man." The idea of women archers is still a relatively new concept in Africa, a traditionally male dominated society. Many tribes believed that even letting a woman touch a bow or arrows would forever curse the items. That idea is slowly changing as more and more women in Africa are taking up the ancestral activity, breaking with traditions. So Why the Interest in African Archery? Reputations for great accuracy that drives fear into their enemies. Able to shoot great distances. Able to shoot heavier bows for larger game, on par with the English yew longbow. Amazing accuracy and confidence even at long distances. A variety of techniques useful for warfare. Learning to shoot and to hunt from an early age. Clearly such skills would be handy, as would the ability to cause your enemies to fear and respect the accuracy of your archers. Imagine for a moment a confrontation between two rival groups. The leader of one group starts waving a gun around and making demands. Tension is high. Ka-thunk. The leader goes down with an arrow between their eyes. The archer is no where to be seen. What should the one group do? Keep making demands? They are currently leaderless and there is an enemy sniper who is basically invisible. If a lieutenant stepped forward to continue making demands, what is to stop the sniper from taking out the new leader? Complete retreat or retreat to a more defensible position are the only logical solutions. For hunting purposes, archery has been used for hunting for over 50,000 years. Firearms have really only become popular during the last 500 years. It would take another 49,500 years to even compare to the sheer number of animals killed by bowhunters over a period of 50 millennia. And African archers are still bowhunting today, using traditional materials, ancient stalking techniques passed down through generations, and with a level of accuracy other cultures are often ignorant about. Clearly African archery is something worth studying for both bowhunting skills and for survival skills.